6.1. My Account/My Points & Reward. In the modern marketing, loyalty programs play an important role that can’t be denied. Online stores put a lot of effort into keeping old customers and increasing sweet engagement scent between customers and stores. Hence, Mageplaza Reward points extension is developed to increase the interaction between customers and store owners to establish the great consumption cycle on your website. 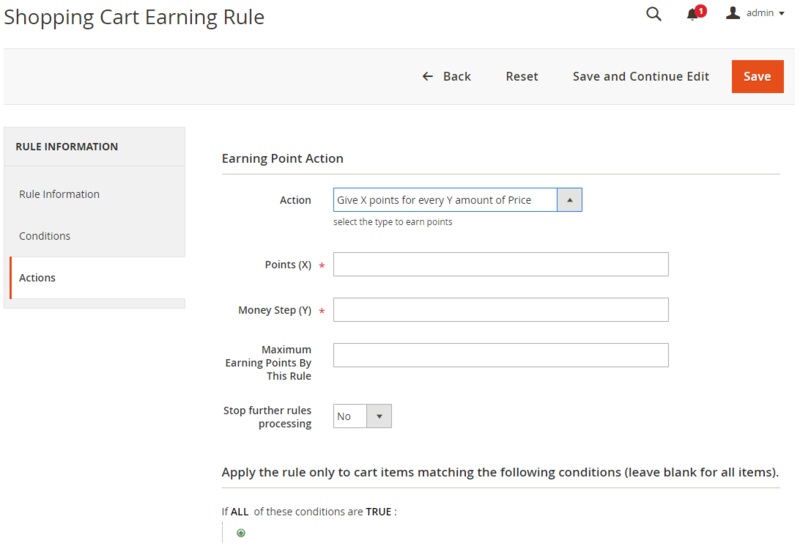 Magento 2 Reward Points extension will allow earning unlimited reward points as well as using them flexibly as payment methods if necessary. By this way, it is not complicated to build the loyal customer network supplying the number of leads for the merchants. The Reward Points system does not apply for guest customers. The Product's Earning Point may vary according to a specific Customer Group and Earning Rate set in the backend. Earning Point(s) of the product can be depended on Customer Group, Earning Rate, Catalog Earning Rules, and Shopping Cart Earning Rules which are configured in the backend. Customers can use their earned reward point(s) to discount the order. This page also displays earning point(s) customers will receive when they place the order. This is familiar to the checkout page. However, Earning Point(s) can’t be shown on this page if admins disable the field Display Earning Points on Shopping Cart in the backend. Notice: Earning Point(s) can be different depend on Customer Group and Earning Rate which are configured in the backend. Admins are able to create and manage Earning Rate, Spending Rate and Transaction as well as to configure the Reward Points extension generally in the backend. 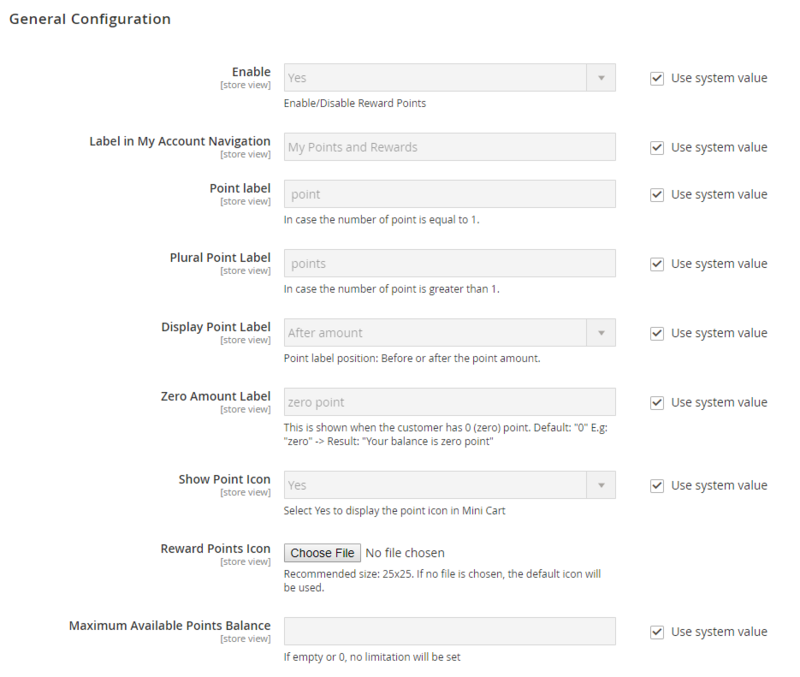 Admins are able to apply changes to reward point(s) in the customer’s account in the backend. Admins are not supported to use reward point(s) when creating a new order at the moment. Earning rate and Spending Rate are stored in the same table inside the database. Therefore, the admin will probably see a slight difference in IDs of rates. This is the place where admins can store Earning Rates created. Delete: Tick the checkbox of the earning rate they want to delete, then choose “Delete” in the Action box (at the left of the grid). Choose “OK” in the confirmation message. To edit an earning rate, choose “Edit” in the Action column. Admins can filter, hide or display Column or export rates. After entering the Earning Rate section, click on Add New Rate to create a new earning rate. Then, click Save and Continue Edit, the page will automatically switch to the Edit Rate page. In the Website field: Choose website(s) you want to apply the earning rate. Only customers who belong to this group can be entitled this earning rate. Customers who belong to different groups can receive different earning rates even when they purchase the same product. Admins can fill out the appropriate rate in here. However, decimal numbers are not approved. If admins enter a decimal number, they will be rounded following the rule >= 0.5 to 1, or < 0.5 to 0. Indicates the priority of this earning rate compared to other earning rates. 0 indicates the highest priority. The higher number, the lower priority. If there’re many earning rates which have similar priorities, rules will apply on the rate which has a smaller ID first. This is the place where admins can store Catalog Earning Rules created. 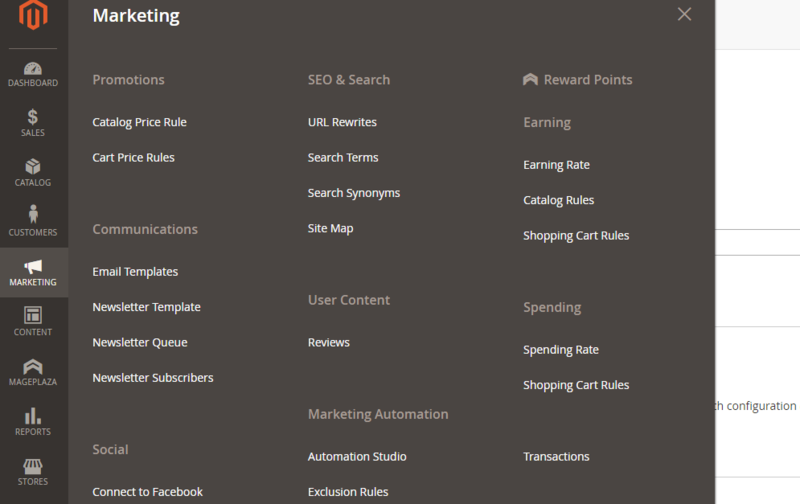 From the grid view, admins can acknowledge some fundamental information of an catalog earning rules such as ID, Name, Website, Customer Group, Status, Create On, Expired, and Priority. Admins can filter to search for a specific rule. After taking some modifications on the rule, click Apply Rule to enable it immediately. At the Add New Rule page, click on Save and Apply to apply the new rule. 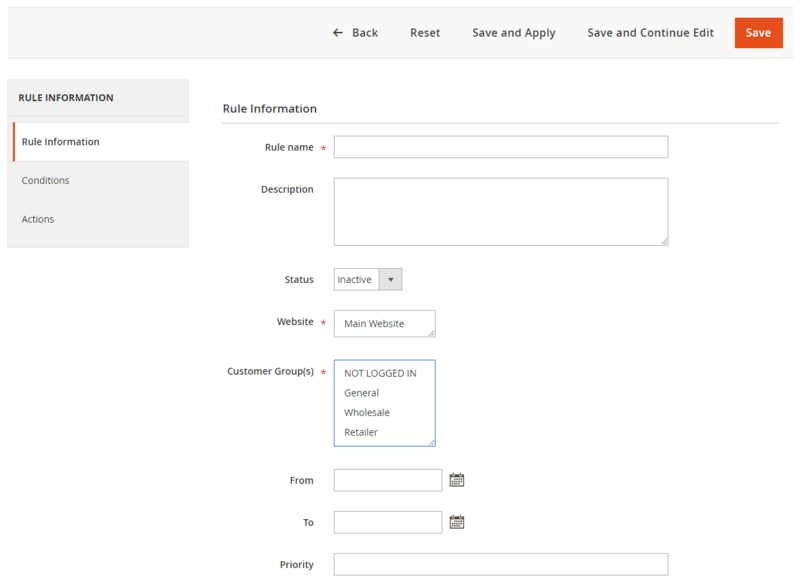 Enter the rule name which will display in the backend. This is required information. There will be an error message if you leave it blank. 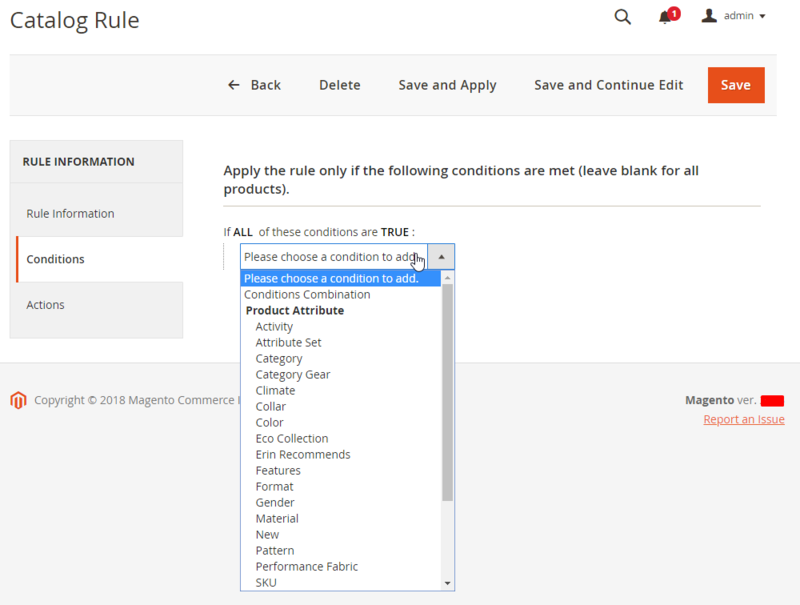 In the Description field: You can note some descriptions of the rule. This field can be left blank. In the Status field: Choose “Active” to apply the rule. In the Website field: Choose website place(s) you want to apply the rule. Choose group(s) of customer you want to apply for them. If the rule applies to Not Logged In customers, they still can learn earning point(s) of each product but point(s) won’t be add unless they sign in or sign up on your store. In the From field: You can set up the start time to use the rule, please note about the different of timezones. In the To field: You can set up the end time to disable the rule. Identifies the usage priority of this catalog earning Rule compared to others. 0 is the highest priority. The higher number represents the lower priority. If two catalog earning rules has the same priority, the rule with smaller ID will be applied. 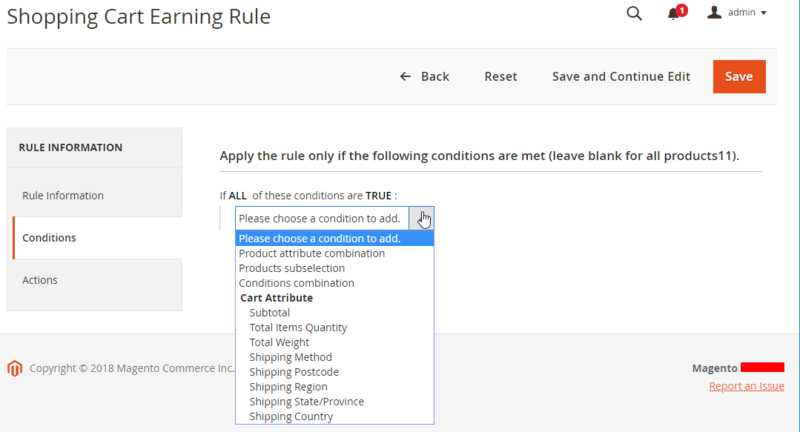 Choose condition to apply the rule. Only Product pages which meets those conditions will be applied. Customers will receive a fixed X point(s) for a product in their cart. In the Point X field: Enter fixed point(s) you want to set for customers. E.g: If Point X = 5, customer will receive 5 points per product they add to their cart. 2 items will be 10 points, no matter how pricing is. In the Point X field: Enter X point(s) customer will receive for every Y amount of price. In the Money Step field: Enter the minimum Y amount so that customer can receive X points. Pricing will be rounded following Rounding Method of the configuration. 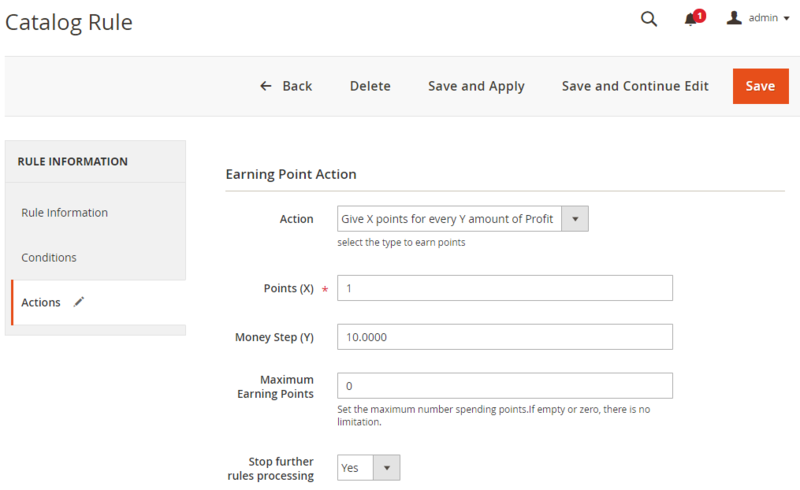 In the Maximum Earning Points field: Set the maximum earning point customer can get from this rule. Some products that admins enter cost - as the price entered into that product. Profit is calculated by the sale price minus the cost. Action Give X points for every Y amount of Profit will transfer the difference to Point. If the product is not filled Cost, Profit is equal to Price. In the Point X field: Enter X point(s) customer will receive for every Y amount of regular price (profit). Stop further rule processing: Choose “Yes” to restrict the number of catalog earning rules applied to a product. E.g: Let’s say there are 4 Cataloging Earning Rules created in turn, Rule 1, Rule 2, Rule 3, Rule 4, and priorities are 0, 5, 3, 3. All rules choose Stop further rules processing = No: 4 rules will be applied and points are accumulated. The customer will receive points from the summation of 4 rules. Rule 3 has Stop further rules processing = Yes: After applying, rule 1 will be applied (since it has higher priority) and rule 3. Rule 2 and 4 won’t be applied because they have smaller priorities. From the grid view, admins can acknowledge some fundamental information of a Shopping Cart Earning rule such as ID, Name, Status, Create On, Expired, and Priority. Shopping Cart Earning Rule doesn’t apply to NOT LOGGED IN CUSTOMER. 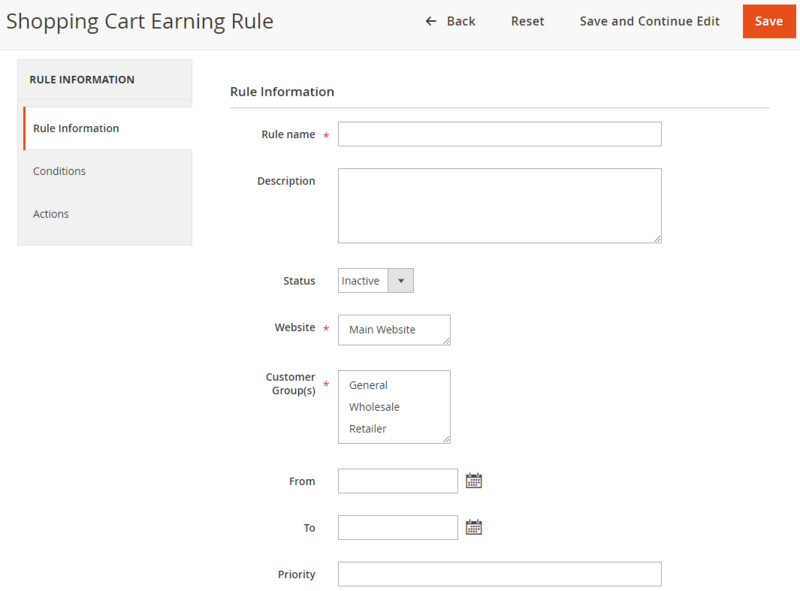 Identifies the usage priority of this shopping cart earning rule compared to others. If two shopping cart earning rules has the same priority, the rule with smaller ID will be applied. Choose condition to apply the rule. Only the cart which meets those conditions will be applied. Customer will receive a fixed amount of point(s) based on a purchased cart. In the Point (X) field: Enter point(s) customer can earn. This is the required field. E.x: Point (X) = 5 which means no matter how many products in the customer cart, they will only earn 5 points. In the Point X field: Enter X point(s) customer will earn for every Y amount of price. 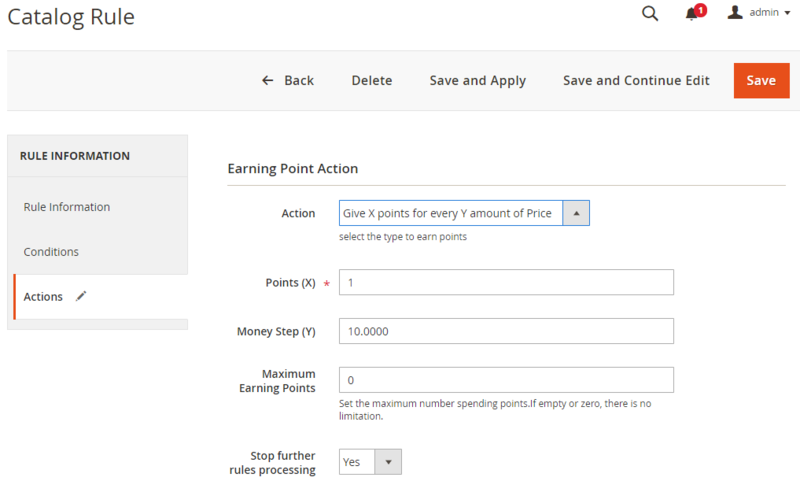 In the Maximum Earning Points field: Set the maximum earning point customer can earn from this rule. When the customer place order a cart which has 6 products, he will earn 6 points. When the customer place order a cart which has more than 15 products, he will earn 5 points only. Only when product(s) in the cart meet these conditions, rule will be applied. This is the place where admins can store Spending Rates created. Delete: Tick the checkbox of the spending rate they want to delete, then choose “Delete” in the Action box (at the left of the grid). Choose “OK” in the confirmation message. To edit an spending rate, choose “Edit” in the Action column. After entering the Spending Rate interface, select Add New Rate to create a new spending rate. Then, click Save and Continue Edit, the page will automatically switch to the Edit Rate page. In the Website field: Choose website(s) you want to apply the spending rate. Only customers who belong to this group can use their point(s) following this spending rate. Customers who belong to different groups use different spending rates even when they purchase the same product. Admins can fill out an appropriate rate in here. However, decimal numbers are not approved. If admins enter a decimal number, they will be rounded following the rule >= 0.5 to 1, or < 0.5 to 0. If there are many spending rates which have similar priorities, rules will apply on the rate which has a smaller ID. This is the place where admins can save all Shopping Cart Spending rules. From the grid view, admins can acknowledge some fundamental information of a Shopping Cart Spending Rule such as ID, Name, Status, Create On, Expired, and Priority. Shopping Cart Spending Rule doesn’t apply to NOT LOGGED IN CUSTOMER. 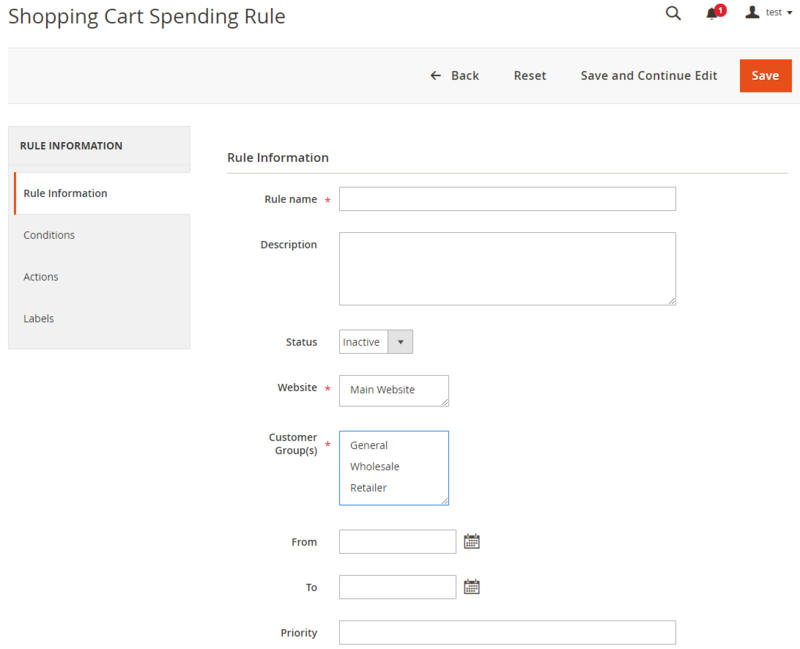 Identifies the usage priority of this shopping cart spending rule compared to others. If two shopping cart spending rules has the same priority, the rule with smaller ID will be applied first. Conditions: Only cart which meets chosen conditions can be applied. 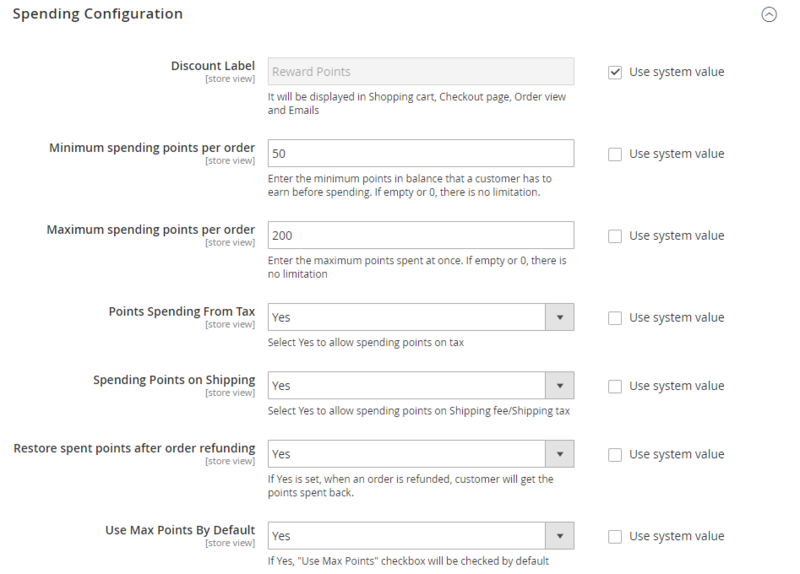 Give discount for fixed X points: Customers can spend a fixed point(s) that admin set in this section. Give discount for every X points: Cusstomer can spend point(s) to use X points to get discount for every Y amount (Y will be set up in the Action tab). The applicable X points cannot be exceeded ** Maximum Redeemable Points**. In the X Point field: Enter the number of point(s) you want to set for the above conditions. Give a fixed discount amount for the whole cart: Discount Amount is set fixedly for every X point(s). 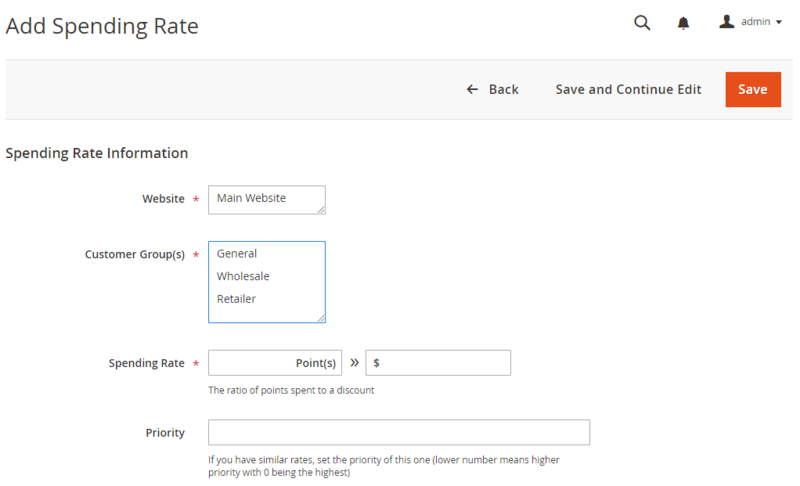 Give a percent discount amount for the whole cart: Discount Amount is calculated based on percent of Order Total. 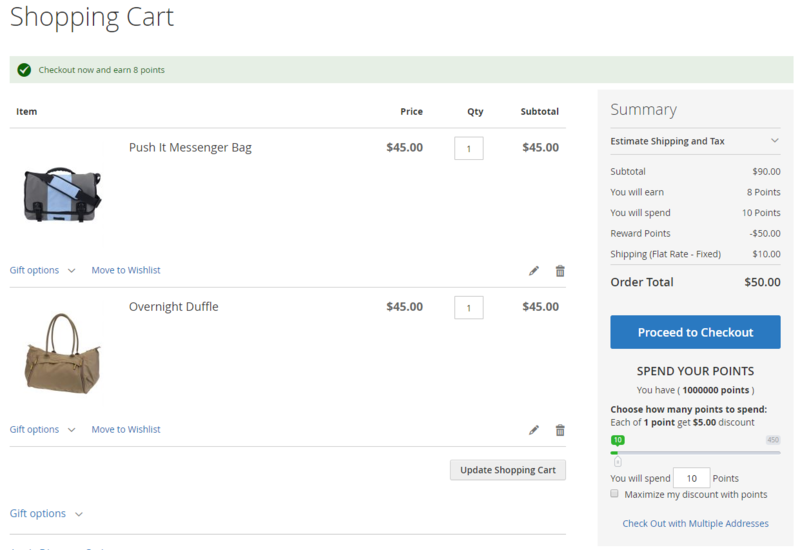 The customer will be discounted $10 for every 1 point spending if in the backend, the admin chooses Action = Give a fixed discount amount for the whole cart. Particularly, he spends 1 point and only needs to pay $490 for the order (which hasn’t been included Shipping Fee and Tax). 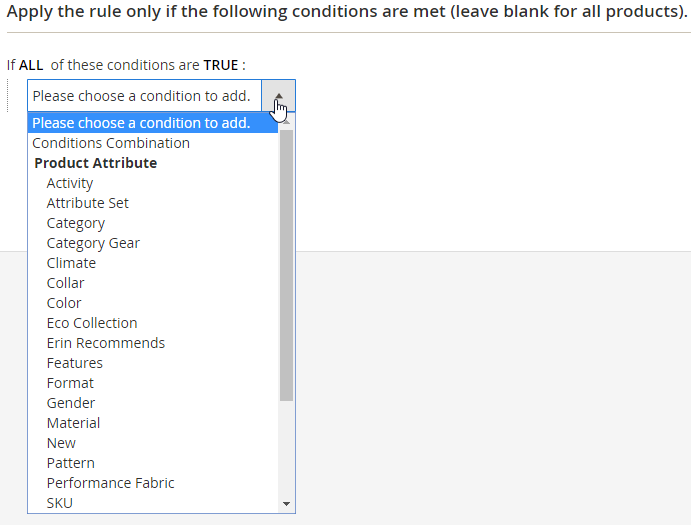 Besides, admins can configure more conditions to apply the rule properly. This is where admins configure the lable for the rule in every Store View of a store. If it’s left blank, default lable will be displayed on the frontend. The right path is Marketing > Reward Points: Transaction. This is the place where admins can create and manage transactions. By entering this interface, admins can add/minus customer’s reward point(s). View: To review a transaction, choose “View” in the Action column. Cancel: To cancel a created transaction (in case its expiration date hasn’t come yet), select the transaction and choose “Cancel” in the Action box (at the left of the grid). Expired: Admins need to take this action if a transaction isn’t expired automatically. At this point, take the same action when admins view/cancel a transaction, choose “Expired” then process with the OK button. Admins can filter, hide/display Column or export rates. After entering Transaction tab, choose Add new transaction to generate a new transaction. Next, click Save and Continue Edit, the page will direct to the View Rate page. Click this section to display the store’s customer list in the popup form. Admins can only choose 1 from this customer list. Name of the chosen customer will be added reward point(s) to her/his account. If you leave this field blank, there will be an error message. Enter the number of point(s) you want to add for the chosen customer. If you enter negative numbers or leave it blank, there will be an error message. Enter the comment that will be sent along with the added point(s) to the chosen customer. 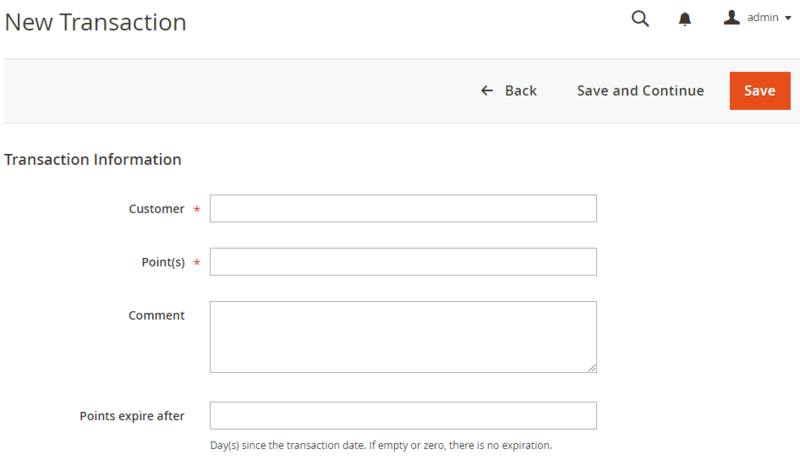 The added point(s) of this transaction will be expired after X day(s) from the time you create this transaction. Admins have the right to add higher point(s) than the maximum point of the amount which a customer can accumulate (E.x: max point = 1000, admins can add 1100 points or even more to the customer balance). Admins can review or expire a transaction in the View Transaction page. This general configurations can apply for the whole module. In the Enable field: Choose “Yes” to active the Reward Point extension from Mageplaza. In the Label in My Account Navigation field: Enter the name of Tab Reward Point displayed on the frontend at the My Account > Reward Point section. This label will be displayed on the frontend. If the balance is greater than 1, this label will be displayed on the frontend. Select After Amount to display the point label after number (ex: 5 points). Select Before Amount to display the number label before number (ex: points 5). Enter the label when the customer’s account balance is equal to 0. In the Show Point Icon field: Choose “Yes” to display the point icon on the frontend. The upload image will be used as the point icon and be shown on the frontend. JPG, PNG or GIF files are accepted. There will be an error message if the input file is invalid. If you leave it blank, the default icon will be used icon. Set the maximum number of point(s) that the customer can accumulate by purchasing. If customer’s account balance reaches to this number, there will be no more points awarded to the balance, and reward point(s) indicators will not be shown on the frontend. Admins can add point(s) to an account balance with no awareness of this value. Normal: The number of points converted from the currency (USD, EUR, …) will be rounded according to the normal rule. E.x: 10.2 rounded to 10; 10.8 rounded to 11. Rounding Up: The number of points converted from the currency (USD, EUR, …) will be rounded up. E.x: 10.2 or 10.8 is rounded to 11. Rounding Down: The number of points converted from the currency (USD, EUR, …) will be rounded down. Ex: 10.2 or 10.8 is rounded to 10. In the Earn points from shipping fee: Select “Yes” to allow Shipping Fee to be converted to point(s). In the Point Refund field: When the customer places an order, they will receive a certain amount of earning points. The shop owner selects “Yes” in this section to retrieve the points when customer refunds the order. Select “Yes” to allow adding earning point(s) to the customer’s account right after the invoice is created. 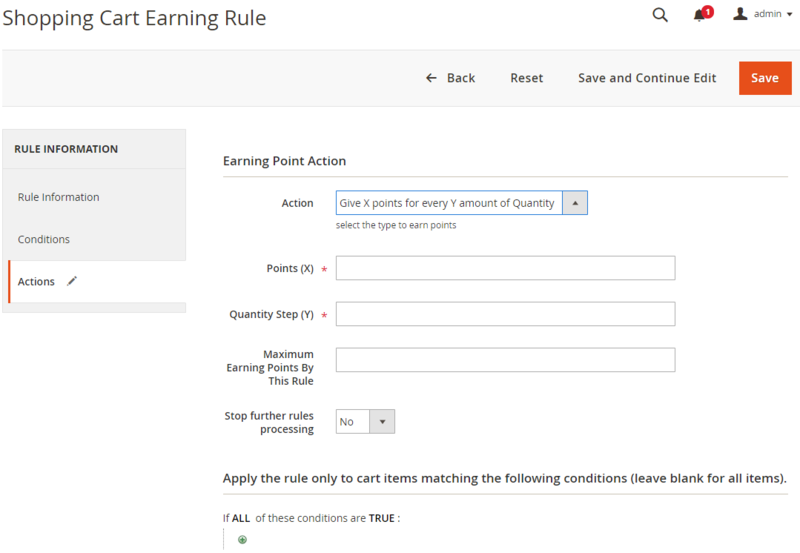 Select “No” to allow adding earning point(s) after the order is completed. The number entered here is expiration day of point(s), it starts to count from the day point(s) is (are) added. If this field is blank, point(s) will be used indefinitely. In the Discount Label field: Discount Label displayed on the frontend will change according to the content of this section. Set the minimum number of point(s) that customers must have in their balances as a condition to spend points on discounting orders. 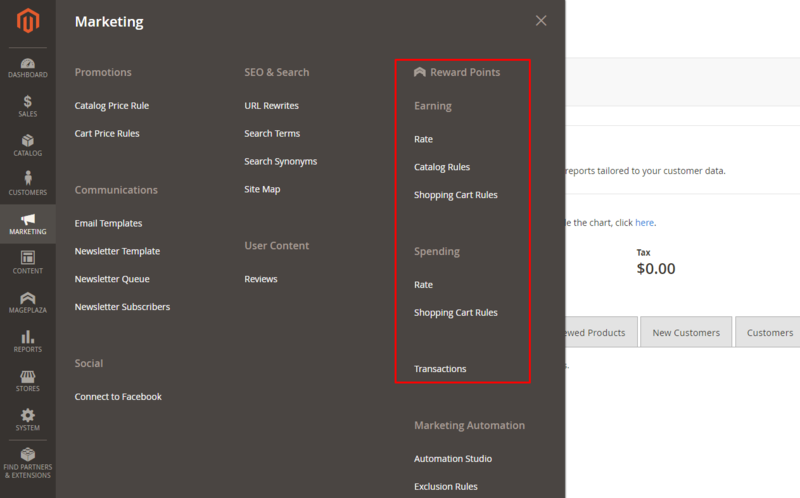 If the number of point(s) in the customer’s balance is less than the minimum spending point, the Reward Points slider will not appear on the View Page or Checkout Page. If you leave it blank or 0, the default minimum point is 0. Set the maximum number of point(s) that customers can use on an order. If you leave it blank or 0, the maximum number of point(s) customers can spend is unlimited (it can be the maximum number of points they own or the maximum number of points which can be converted by SubTotal of Cart). 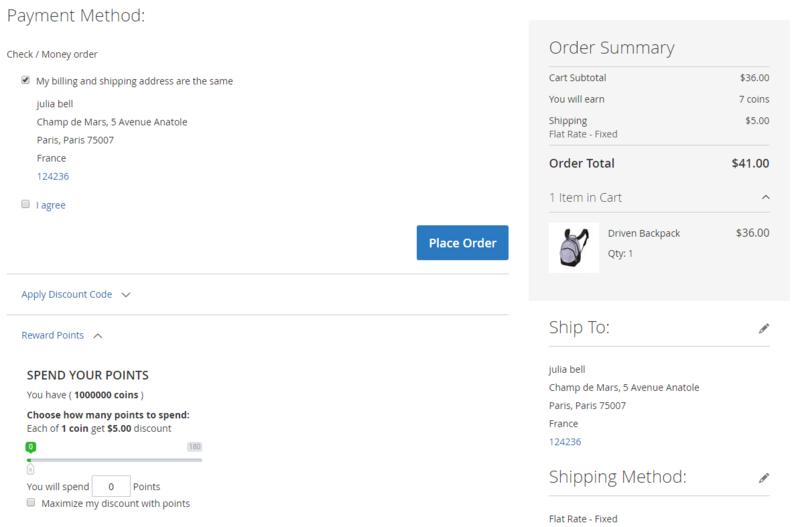 In the Spending Points on Shipping: Select “Yes” to allow customers to use their point(s) to reduce the shipping cost. 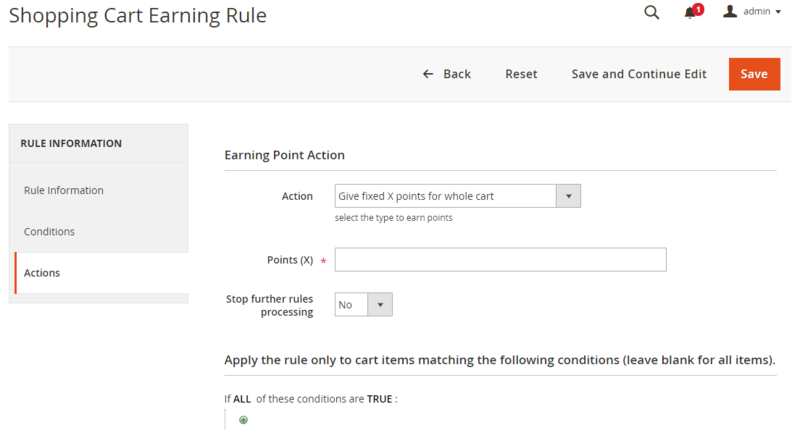 In the Restore spent points after order refunding field: When customers place an order, they can apply a certain amount of their reward point(s). Admins select “Yes” in this section to return point(s) to customers if their orders are refunded. In the Use Max Point By Default field: Select “Yes” to set the customer’s spending point(s) to the maximum number that they can use. In the Display Total Points on Top Links field: Select “Yes” to display the total number of reward point(s) that customer has on Top Link. 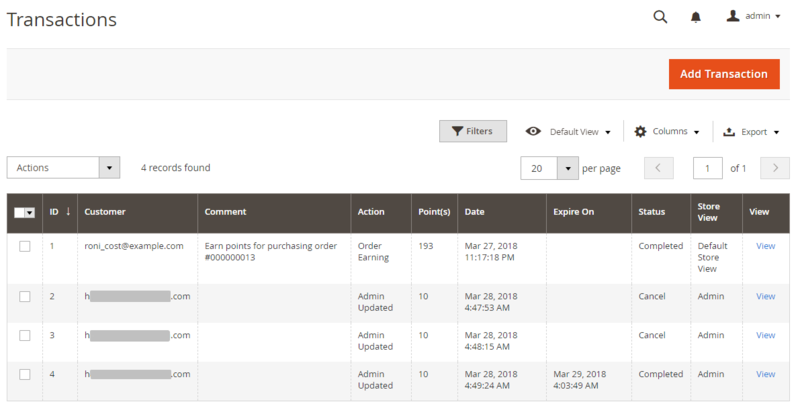 In the Display Points Summary on Dashboard Page field: Select “Yes” to display the total number of reward point(s) that customer has in the Reward Point tab. 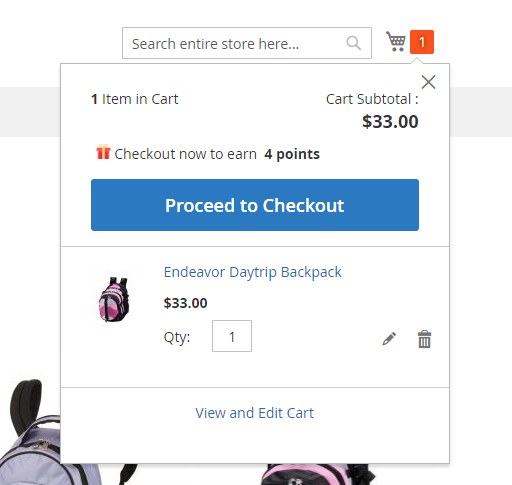 In the Display Earning Points on Minicart field: Select “Yes” to show the total number of earning point(s) customers can receive when checking out the cart at the Minicart page. 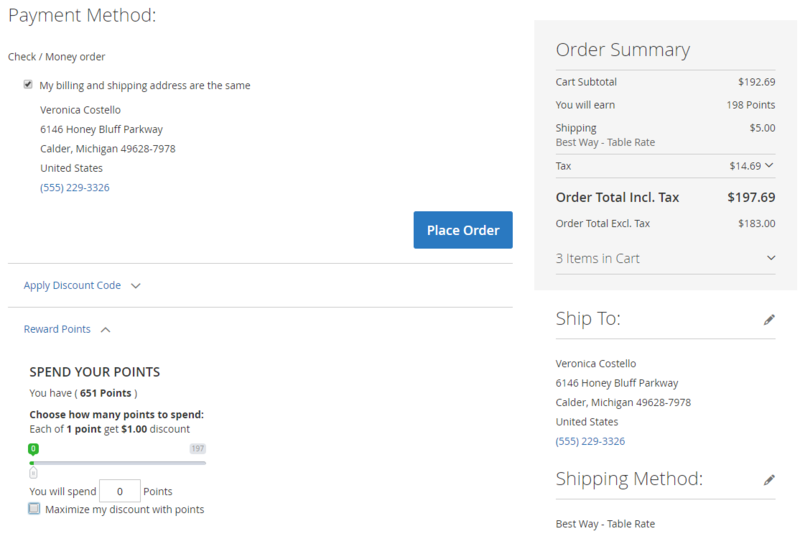 In the Display Earning Points on Shopping Cart field: Select “Yes” to display the total number of earning point(s) customers can receive when checking out the cart at the View Cart Page. (Shopping Cart). In the Enable Notification Email field: Select “Yes” to allow notification emails to be sent to customers. In the Subscribe customers by default field: When a new customer subscribes to a store, receiving no emails is set as default. Select “Yes” in this section so that when their first transaction is made (by purchasing or by admin), Reward Points Notification will be checked immediately. 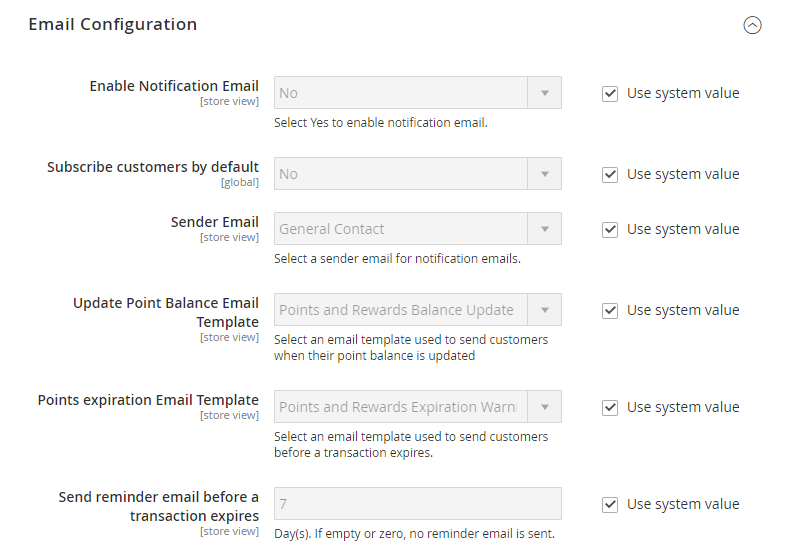 Pre-installed email configuration that customers can receive the notification mail when there are changes in their balance. To change Email Template, admins can create another one under Marketing > Email Template. The instruction to create a new Email Template can be found here. Pre-installed email configuration that customers can receive the notification mails when their reward point(s) is (are) about to expire. To change the Gift Card Email template, admins can create another one under Marketing > Email Template. Set how many day(s) before the expiration date the email can be sent. If you leave the field blank or 0, reminder email will not be sent. 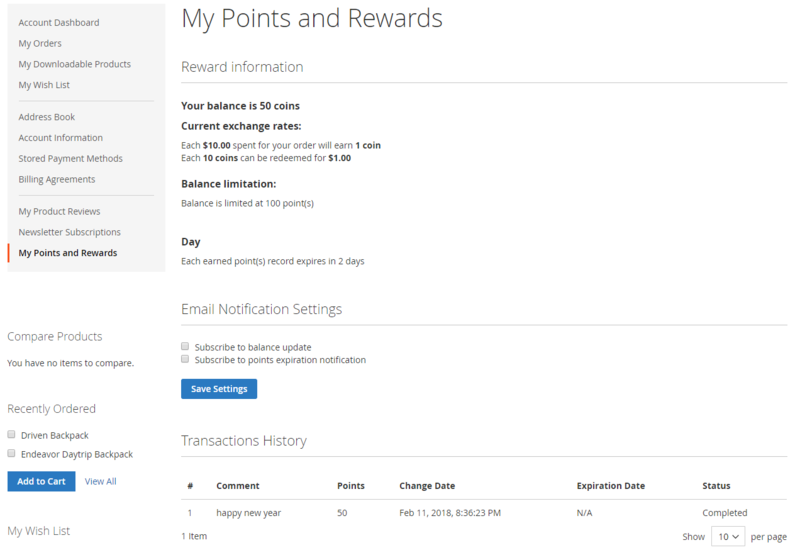 Admins can manage Reward Points Balance, Transactions and Notification of customers by going to Customer > Edit Customer > Reward Points. In the Reward Points Balance field: Indicates the total reward point(s) the customer has. In the Reward Points Notification field: Admins can register or cancel the subscribe on behalf of the customer when their balance is updated or point(s) is about to expire. 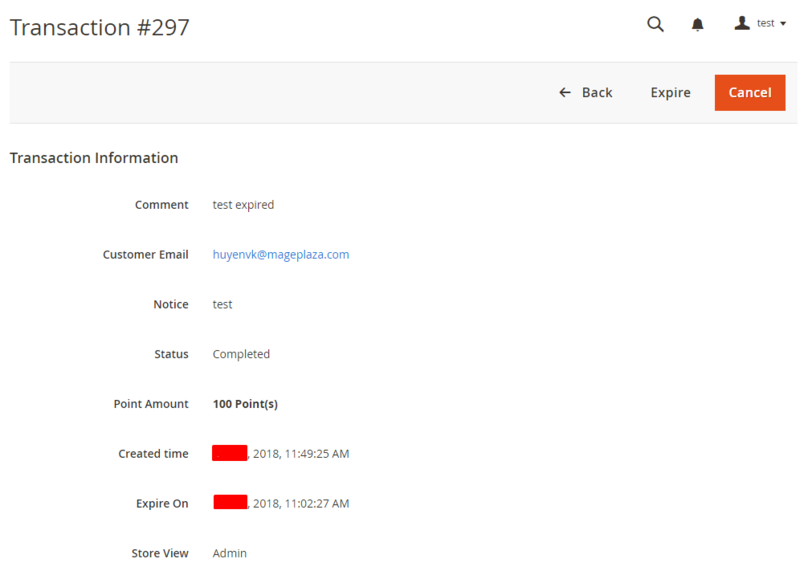 In the Reward Points History grid: Displays information about all executed transactions: ID, Store View, Point, Point Spend, Date, Date Expired, Comment. The information about Balance, Notification and Transaction in the backend will be synchronized with the customer’s frontend at My Account > My Points & Reward. The total reward point(s) that customer has. Earning Rate and Spending Rate that customer is entitled (according to his Customer Group and Website set in the backend). The maximum number of points that the customer’s balance can receive from orders. The maximum number of days that point(s) can be used since that customer receives point(s). Made transaction(s) and its comments. They can also sign up to receive updates when their balance changes or point(s) is about to expired. Customers can use the slider or text box to select the amount of reward point(s) they want to spend. Used reward point(s) can be limited to a range. Customers are only allowed to use their point(s) within this range. If Subtotal has a value less than the minimum value of the limited value range, the Apply Reward Point section will not be displayed. The total points that customer has if Total Point(s) < Max Point for per Order and Subtotal. Max Point if Max Point < Total Point and Subtotal. The number of point(s) which is equal to Subtotal if that amount < Max Point and Total Point. The Order Summary box will display more sections about reward points to make the calculation easier. 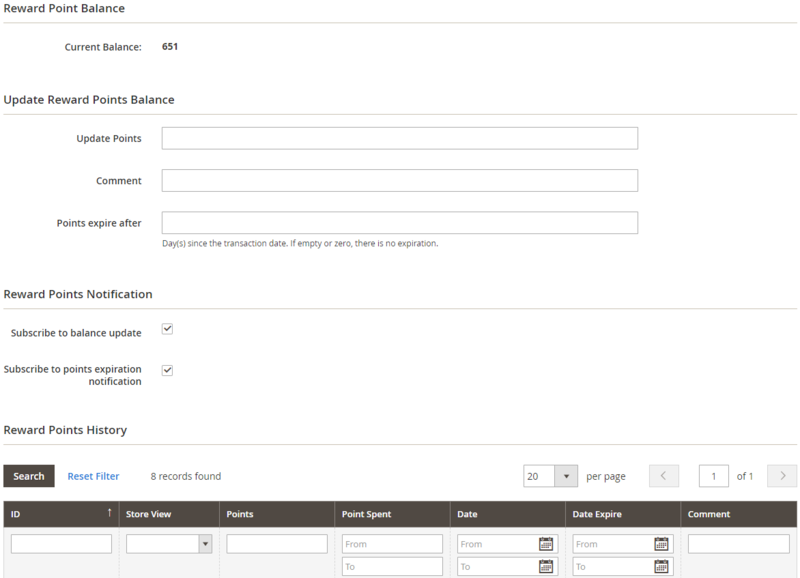 Spending Point can be used for Tax, Shipping Fee if it’s configured in the backend. 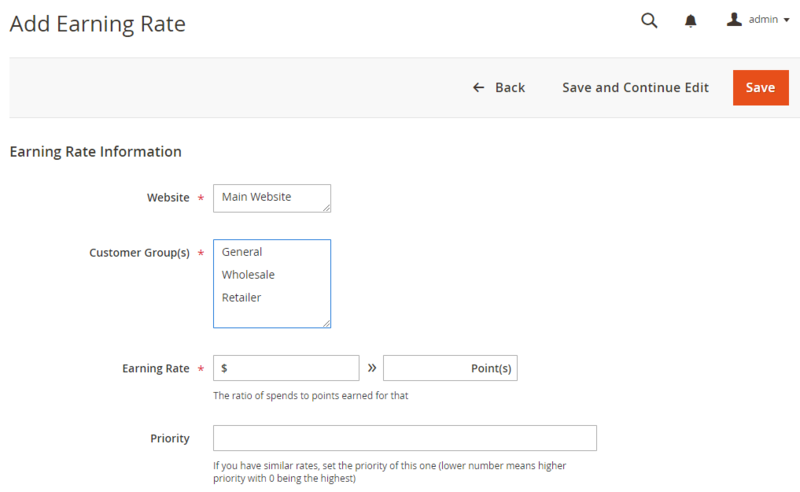 The conversion rate between Reward Point and Spending Point depends on the Spending Rate configuration in the backend. Top link: Displays the point(s) that customer has. MiniCart: Displays the earning point(s) of all products in the cart. 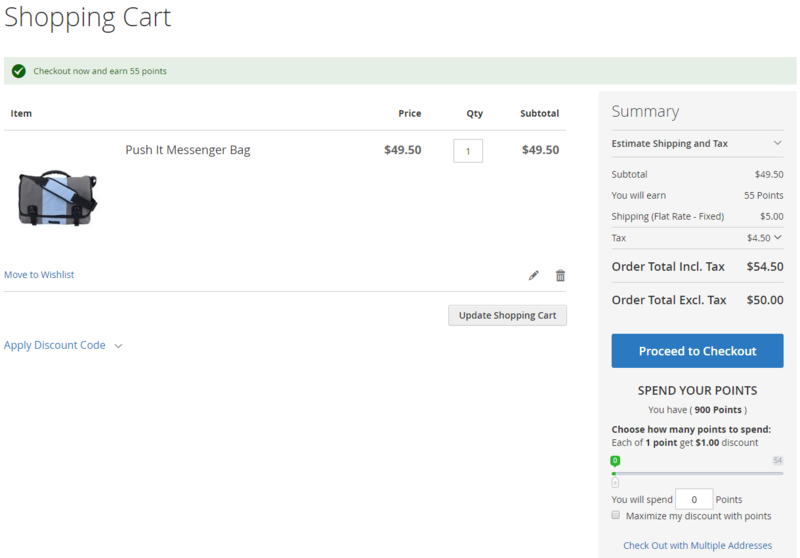 View Cart Page (Shopping Cart): Displays Apply Reward Point on the checkout page, and also displays the Earning Point, Spending Point and Reward Point.